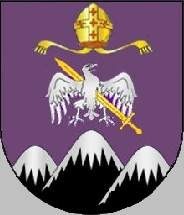 Shield Purpure, a sinister facing eagle Argent, pierced by a sword Or in bend, issuant from base a triplemount Sable with snow covered peaks (Argent), in chief a mitre Or garnished Gules. Mural crown Argent with three visible towers (borough rank) and white scroll with inscription in black capitals "MESÃO FRIO - S. NICOLAU". Commune was one of the pre-2013 communes of Mesão Frio Municipality; it had 484 inhabitants in 2011 and covered 0.5 km². Shield Or, three mountains Sable the peaks snow (Note that the colour of snow, proper, is white, not white/Argent (grey/silver)) covered over a base wavy of Argent and Azure, in central chief two arrows Sable crossed per saltire and cut by a pair of scissors Azure, below two barrels Purpure ringed Argent and nailed Sable, one at either flank. Mural crown Argent with three visible towers (borough rank) and white scroll reading in black upper case letters "MESÃO FRIO - SANTA CRISTINA". 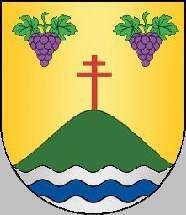 The mountains are referring to the municipal arms. Santa Cristina Commune was one of the pre-2013 urban communes of Mesão Frio Municipality; it had 808 inhabitants in 2011 and covers 6.4 km². Shield Or with base wavy of Azure and Argent, issuant from base a mount Vert, crowned by a patriarch's cross Gules, in chief two grapevines Purpure leaved Vert and ordered per fess. Mural crown Argent with three visible towers (village rank) and white scroll with inscription in black capitals "VILA JUSÃ". Vila Jusã Commune was one of the pre-2013 communes of Mesão Frio Municipality; it had 635 inhabitants in 2011 and covered 2.1 km².